For real European elegance go to the Bellagio Hotel in Las Vegas, Nevada. 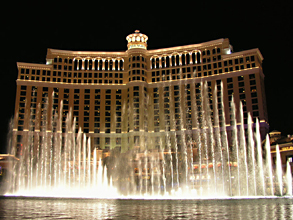 Of all the Las Vegas hotels the Bellagio Hotel has it all, luxurious rooms delicious upscale restaurants, great shopping and fine art displayed throughout the gorgeous Bellagio Hotel. One of its striking qualities is the glass ceiling emitting natural light. All of this light illuminates the striking beauty and lovely charisma that is offered to its guests. The conservatory has trees and fresh flowers that change with the seasons. There is in-depth tile work, and lots of interesting sculpture. Even before you get to your room, your senses will be dazzled. You’ll never find a better dining venue than that of the Bellagio. At Le Cirque you will find fine French food, three times the winner of the AAA Five-Diamond Award. If you opt for the Todd Englishs Olives you will have a grand view of the fountains and if you just want something sweet go to the Jean-Philippe Patisserie. There is shopping on the Via Bellagio but be prepared for the prices. Here are some of the exclusive names you will find, all of them upscale: Prada, Moschino, Chanel and Giorgio Armani, to name a few. For an exquisite pampering visit the two story, 65,000 square foot Spa Bellagio on the second floor. They have 56 treatment rooms with four couples rooms. There are many lounges and it over looks the conservatory with all its lovely plants. They have a full menu of treatments. The most interesting and popular massages at the spa is the Ashiatsu. It is an ancient form of working on the body. A barefoot therapist walks on your back holding on to bars that are embedded in the ceiling. Or if you want to imitate the movie Goldfinger, go for the Egyptian Gold Body Treatment. The most unique entertainment can be found at the Bellagio. Cirque du Soleil puts on a stunning show that incorporates the earths elements of air, fire and especially water. There are 85 acrobats and swimmers that perform above and in a 1.5 million gallon tank. The most amazing thing you will see is when three acrobats dive into the pool from 65 feet above into a very small seventeen foot section of the pool. Then there is the free, state of the art, fountain shows on Bellagios lake. The Bellagio, often described as a mini city, has many surprises. You can find quiet little hideaways where you can read or just sip coffee. Or you can find wide balconies that overlook the fabulous pools. There are 3,933 rooms and 512 suites. The casino will please any gambler with over 116,000 square feet. It has all the standard games any first class casino would have. There is a nightclub called The Light that has a very active dance floor and world class DJs. In a classy Mediterranean setting there are five pools and four Jacuzzis. And they have numerous wedding packages available for the couple that just has to get married in Vegas. The business clientele have not be left out. They have a fully operational business center and 14 meeting rooms in various sizes. And if your corporation wants to throw a huge affair there is a 45,000 square foot Grand Ballroom. The room amenities are what you can expect at a five star hotel. In addition to that they have a concierge, currency exchange, luggage and maid service, a safety deposit box and of course, wake up calls. You must be 21 years old to rent a room and anyone under the age of 18 must be accompanied by and adult. Only four people can occupy a room and you must supply a credit card or cash deposit to cover any incidentals that may occur. The bottom line here is that if you want to stay in a upscale establishment while you are in Las Vegas to gamble, you cant beat the Bellagio hotel. Make a reservation and have a good time.